The research on swimming snake robots is an ongoing project at the Centre for Autonomous Marine Operations and Systems (NTNU AMOS). 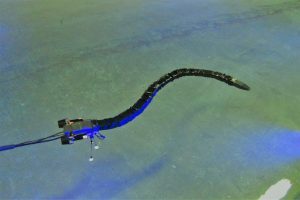 Swimming robot manipulators (referred to also as underwater snake robots) have several promising applications for underwater exploration, monitoring, surveillance and inspection. They thus bring a promising prospective to improve the efficiency and maneuverability of modern-day underwater vehicles. For instance, these mechanisms carry a lot of potential for inspection of subsea oil and gas installations. 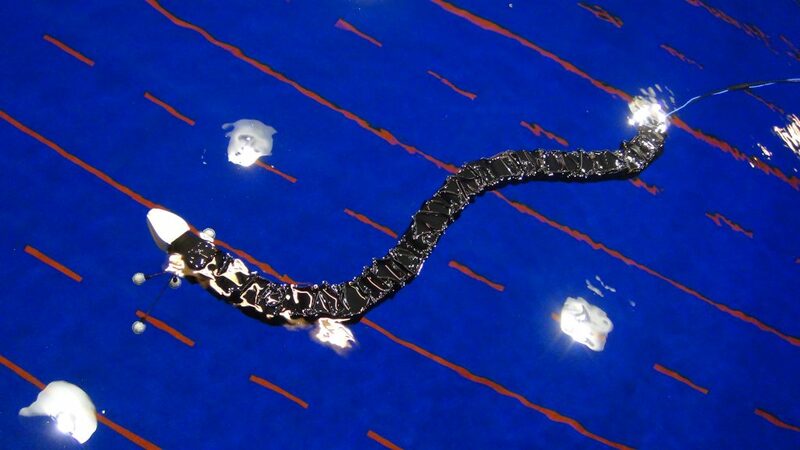 Several research results are obtained with regards to both the theoretical study and experiments using the underwater snake robots Mamba in order to validate the theoretical findings. 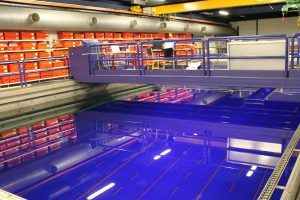 In particular, experimental results are obtained regarding the energy efficiency and path following control approaches by performing several experiments both at MC-lab in Trondheim, Norway and at the SINTEF Fisheries and Aquaculture flume tank in Hirtshals, Denmark (picture above). Using the underwater snake robot Mamba, and the facilities provided by AMOS center through the active collaboration with the AMOS partners and the underwater camera positioning system from Qualisys. Different configurations of the robot are used in order to study the locomotion efficiency of the underwater snake robot Mamba. In addition, experimental results are obtained for different path following control approaches, and these verify that the proposed control strategies successfully steer the robot towards and along the desired path with/without considering current effects. In order to realize operational swimming robot manipulators in the future, several control related task should be investigated. In our group we have been doing research on snake robotics for over 10 years and for the underwater experiments with our newest robot Mamba. The Qualisys camera system is used to capture the motion of the robot. In particular, we manage to close the control loop by feeding the position from the underwater camera system into the controllers in real time using the Labview plugin supplied by Qualisys.